When you have your first child, you do what all first-time parents do: you make a will. When our oldest was born, we found ourselves an attorney and made a will. I remember the meeting where we signed the wills; our son was perfectly content to set in my lap or my wife’s lap and make rude noises. The attorney understood; he had children of his own, including a 9- or 10-year-old son named Aaron. The attorney’s son would grow up to become a poet, Aaron Belz. He’s now published his third collection of poetry, Glitter Bomb. I may have just found a new favorite poet. I had just finished reading poetry by Frank O’Hara when I turned to Glitter Bomb. I understand why Belz, like O’Hara, is often connected to the “New York School” of poetry (John Ashbery is another poet associated with the School). His poems often read like news reports – brief, terse, with a sense of speed and urgency. But Belz also adds a sense of humor, not surprising for someone who is both a poet and stand-up comedian. As usual, I dined alone. and could she make an exception? It’s almost a “poem of manners, ” a discussion of a policy enforcer and a customer who wants an exception made to the policy, until that last sentence. And yet these are not comic poems, or at least not all of them are comic poems. Belz writes about jobs, poetry and language. He plays with language (having some fun with palindromes). He pens a ballad and writes about Sergei Rachmaninoff. He even describes the seven habits of highly infective people. Okay, so perhaps most of these are comic poems. Belz received a B.A. degree from Covenant College, a master’s in creative writing from New York University, and a Ph.D. in English from St. Louis University. His poems and other writings have appeared in literary journals, newspapers, and even popular magazines like Wired. His previous collections of poetry are The Bird Hoverer (2007) and Lovely, Raspberry (2010). 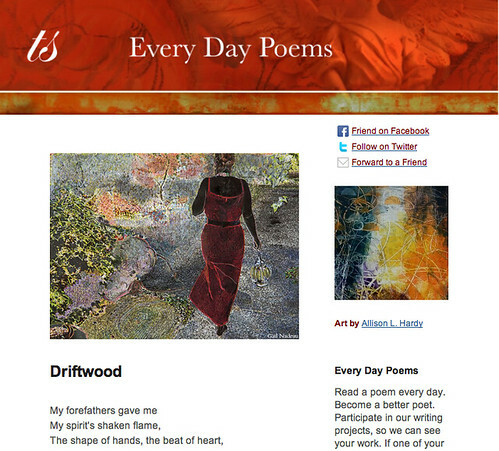 His blog provides links to his published essays, articles and poems. Glitter Bomb is fun, but it is also fine writing. Yes, I have found a new favorite poet. Photo by Jenny Downing, Creative Commons via Flickr. Post by Glynn Young, author of the novels Dancing Priest and A Light Shining, and Poetry at Work. I’ll have to read him. Thank you for the introduction to his work. Wow! Loved the humor in this poem you shared, Glynn. I’ll have to get a copy of Glitter Bomb. Oh, I love this small poem. It is witty in the best of ways, being both surprising and managing to communicate something about human nature. I’m wondering, too, if he might be willing to share his stash of toothpicks 😉 Or, well, did he only make off with the dispenser itself. Aaron is one of my favorites, too. It was a happy accident to discover his poetry a couple of years ago. Glad you featured him, Glynn!